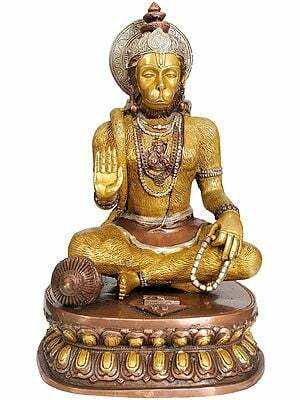 This 53 inches tall statue cast in brass but glass-like finished and polished and more lustrous than an image cast in pure gold, represents the monkey god Hanuman, a divine form that inspires affection as does a loving child, not devotion due to a god. 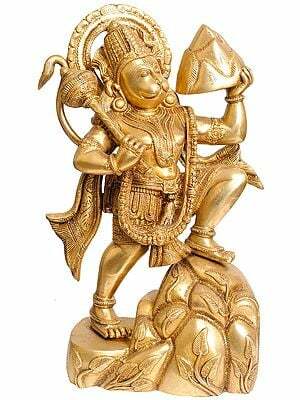 A lovable god, everyone, from a billionaire to a hut-dweller, except the wicked and the evil, loves Hanuman. 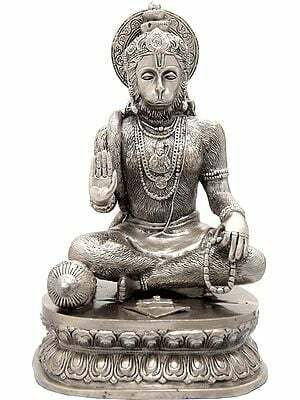 From a humble brick-structure or a pile of mud to a moderately large structure Hanuman has dedicated to him thousands of shrines – a far greater number than that of the shrines dedicated to his master Rama. To wicked and evil, even his name – not a rite or full length hymn, is a terror. 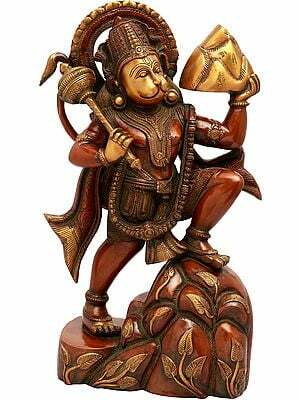 As acclaims a couplet in his most popular hymn ‘Hanuman-Chaleesa’, a hymn with forty couplets dedicated to the monkey-god : ‘Bhuta-pishach nikat nahi aabeyn, Mahabir jab nam sunabeyn’, that is, wherever the name of the monkey god Hanuman is commemorated, ghosts, demons – wicked ones in contemporary context, dare not come around. Except in his five-faced manifestations, his images are rendered pursuing the standards of normal human anatomy. 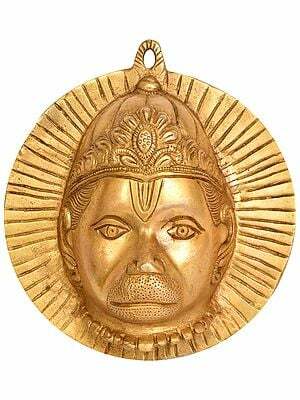 This five-faced manifestation represents the spirit of entire live nature that five animal species represent and manifest in the five faces of the monkey god. 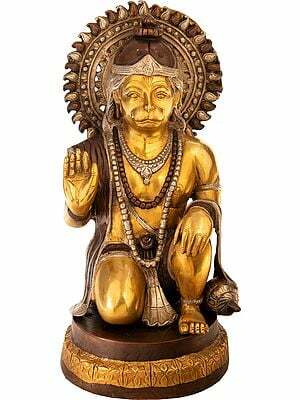 Unlike other gods, usually multi-armed, the images of Hanuman are rendered with normal two hands, usually folded as awaiting a command, or making a prayer. 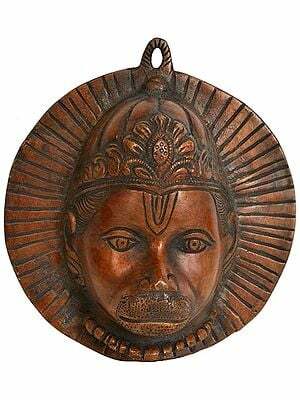 He has been invariably portrayed as humbly clad and adorned with few ornaments – more often the laces of ordinary beads as used in commemorative rosaries, and always has the same attribute – the mace, in one of his hands, or lying around. 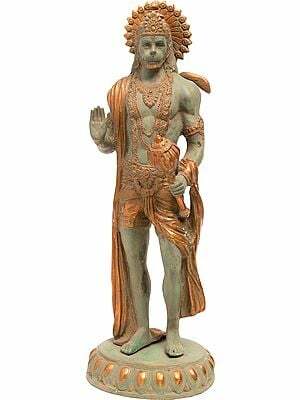 To be a servant of Rama, as he defined his status, and utmost humility are the essence of Hanuman’s being. He never claimed divinity, his domain, and splendour, his style, and hence, nothing with divine perspective in his anatomy. He neither teaches nor sermonizes, nor has associated with him any intellectual or theological discourses; he only acts, obeys his master’s commands or just attends upon his master. 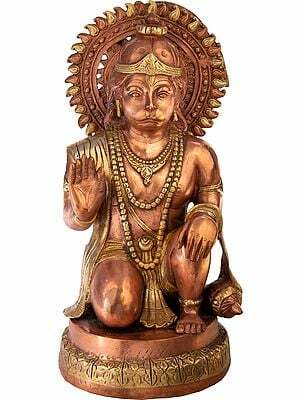 However, this image of Hanuman, though not much different to a lay eye, subtly departs from such established norms. 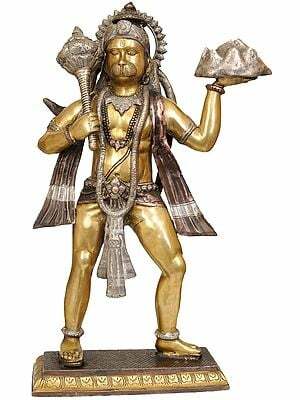 Though the same two-armed anatomy and a loincloth, not any different in dimensions and the length, as usual, the waist-band along a dwarf central-patta worked with gold, and a lavish girdle with a large brooch that hold the loincloth over the waist, are far luxurious to a humble image of the monkey god. Ornaments are still few but not of the type of commemorative beads but all of gold. 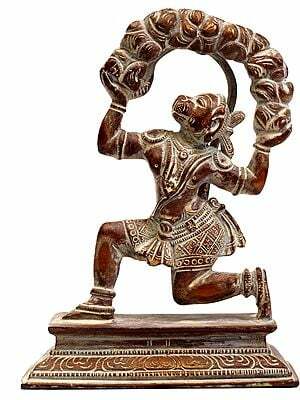 A characteristic feature of Hanuman’s iconography, his right foot, and right alone, has an anklet on it. In Indian tradition anklets, the essential ornament of a woman, denotes dedication; a woman’s two-way, to her husband, and to her children, her feet guided by her duty towards them. 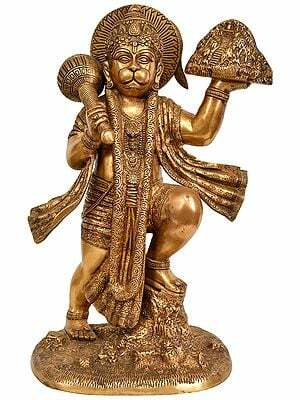 Hanuman was dedicated to Rama and Rama alone, and acted only for him; hence, anklet just on one foot, the right one, as it is with the right foot that one initiates his movement. 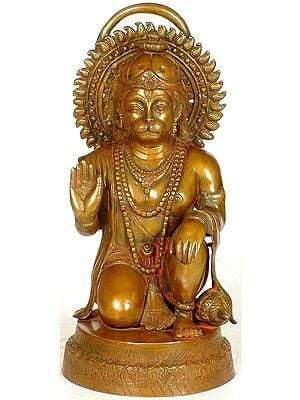 Divine aura that bursts out of the entire image apart, most significant is the monkey-god’s ‘abhay’-granting form that transports him into divine zone that Hanuman had always evaded. 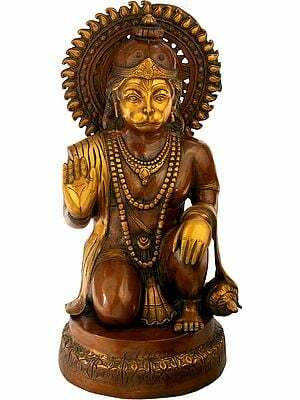 An ‘abhay’-granting mode is an essential aspect of divine icons, his master’s, not Hanuman’s, though in his iconography ‘abhay-mudra’ has far greater relevance than in most other divine images. 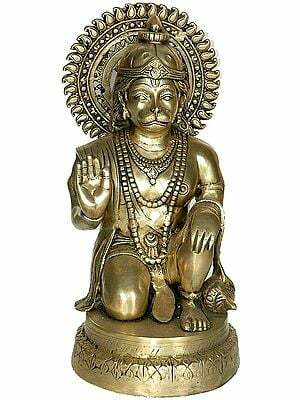 Hanuman, even by his iconic presence, assures freedom from fear of everything untoward; in ‘abhay-mudra’ such iconic presence assures more formidably. 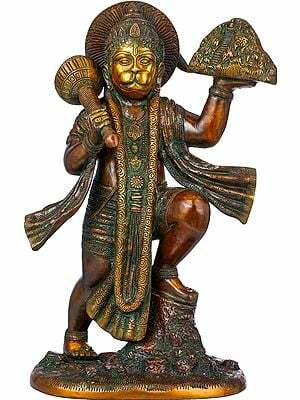 Hanuman is worshipped primarily as the redeemer in crisis : ‘Ko nahi janat hai jaga mein Kapi Sankata-mochana nama tinharo’ – who knows not in the world, O Monkey-god, redeemer in crisis is thy name. 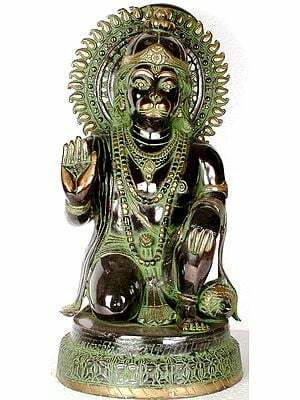 As occasions of misfortune outnumber those of happiness in life, mankind looks more to him who redeems from misfortune, and hence, in devotion tradition Hanuman is more widely worshipped than any other god of any pantheon in India. 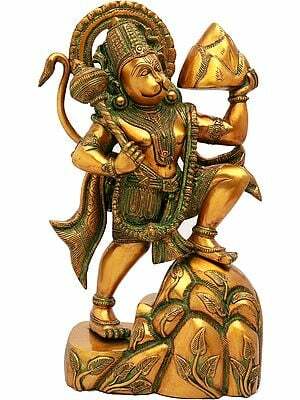 Hanuman’s power to redeem is not a mere theological conceptualization or a believer’s hypothesis, but his life is its example. 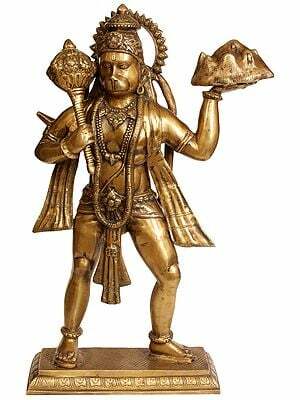 In the face of a crisis this emissary and servant of Rama often rises above his master. After Sita was stolen and a broken hearted Rama wandered in her search, Hanuman not only waded across ocean to Lanka and discovered her there in Ravana’s captivity but also brought to his aid the Kishkindha’s monkey king Sugriva, his entire army and ministers to include Nal and Neel who spanned the ocean and enabled Rama’s army to reach Lanka. 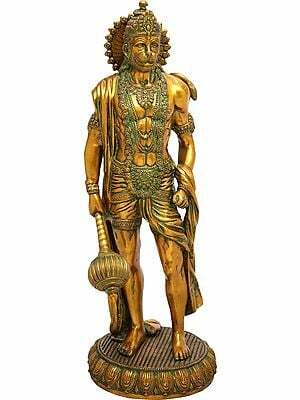 He also brought to Rama’s side Ravana’s brother Vibhishana who, in Rama’s conflict against Ravana, proved more instrumental than columns of army. 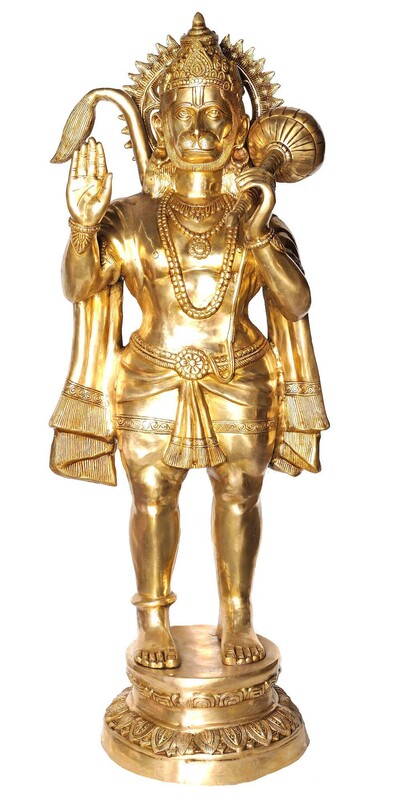 When struck by the ‘shakti’ – divine weapon of Meghanath, Ravana’s eldest son, Lakshmana swooned and helpless Rama only wailed, Hanuman not only brought Ravana’s personal physician Susen competent to cure Lakshmana but also the mountain Dron from the Himalayas with herb Sanjivini on it and Lakshmana’s life was saved. 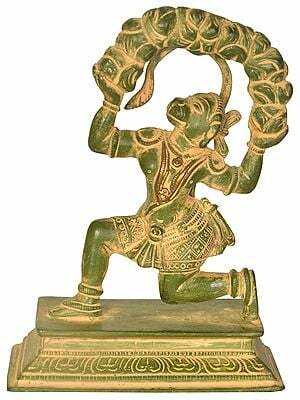 He rescued Rama and Lakshmana from Ahiravana’s custody almost when Ahiravana was going to behead them for sacrifice. 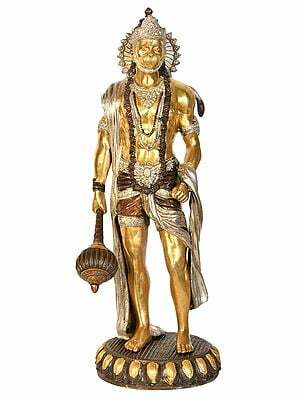 Bharata had pledged to end his life by immolating himself if Rama did not return to Ayodhya before sun-set on the day his fourteen years of exile ended. 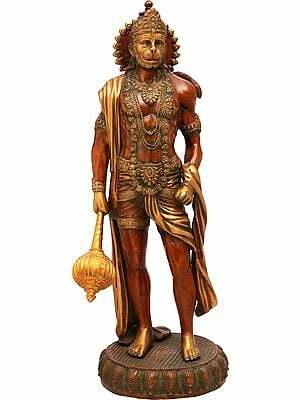 Rama was delayed, but before Bharata immolated himself Hanuman rushed to Ayodhya, assured him that Rama would reach there in minutes and saved Bharata’s life. 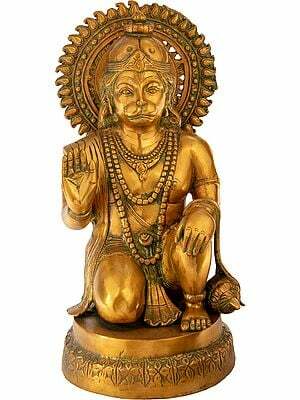 Thus, such was the glory of Hanuman that Rama had himself lauded it : ‘Rama jasu jasa ap bakhana’ – Rama himself narrated his glorious deeds. 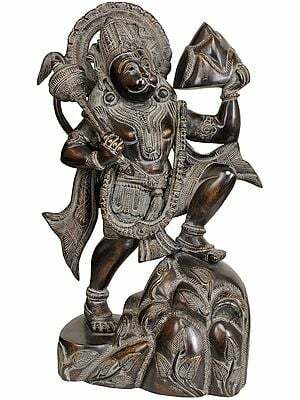 In his case ‘abhay’ denotes assurance of his protection against evil and thus its greater relevance in his imagery.